Please note that the content of this book primarily consists of articles available from Wikipedia or other free sources online. Hazen is an unincorporated community in Churchill County, Nevada, United States, about 12 miles southeast of Fernley and 16 miles northwest of Fallon, on U.S. Route 50. 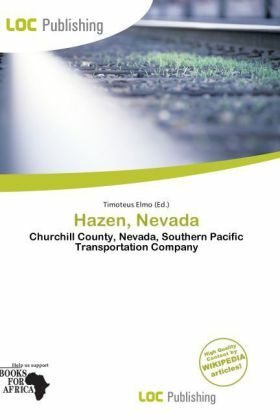 Hazen was founded in 1903 as a station on the Southern Pacific Railroad. Some sources say the town was first settled in 1869, but it doesn't appear on maps until 1903. The community was named for William Babcock Hazen, an aide to William Tecumseh Sherman. At one time Hazen had a post office, which was established in 1904. Hazen's early economy was driven by railroad workers and canal and dam builders, who patronized the town's saloons and brothels.